Near Parthenay, capital of Gâtine country, the Villa Ayrault is a lovely house in the avant-garde architecture of the 30's. Deliciously retro and vintage, guests are taken on a voyage through time right through to the Sixties. 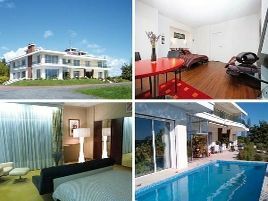 Large grounds with heated swimming pool. Spacious rooms,leather, wood, rugs, unusual furniture... the sixties world of Jacques Tati isn't far way ! Guest meals with the emphasis on local products. With reservation, a brunch can be served in place of breakfast. A warm and friendly welcome. .
- vol en montgolfière depuis le parc de la maison sur place (se renseigner). - Voie Verte et vallée du Thouet (à vélo) à 500 m (nombreux itinéraires labellisés). - pêche dans le Thouet à 1 km. - golf du Petit Chêne à 19,9 km et golf des Forges à 28 km (27 trous, 3 parcours possibles). 4 rooms with bath, shower, WC and TV. Rooms accessible by lift. 80 euros (1 or 2 pers.). Extra bed 20 euros. Reduced rates from the 3rd night. A 10, dir. Nantes, puis Parthenay (venant de Paris) ou Niort Échiré, Angers, Saumur, Thouars (en venant de Bordeaux). À la sortie de Parthenay, sur la D 938. The closest station is Parthenay, located at 3 km. The closest airport is Poitiers-Biard, to 50 km.